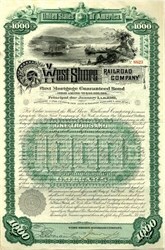 Beautiful certificate from the West Shore Railroad Company dated in 1885. This historic document was printed by American Banknote Company and has an ornate border around it with a vignette showing a train next to a harbor with a steamship and sailing vessel in the water. This item has the signatures of the Company's President and Secretary and is over 123 years old. Organized in conformity with the provisions of an act of the Legislature of the State of New York, entitled "An Act to facilitate the reorganization of railroads sold under mortgage, and providing for the formation of new companies in such cases," passed May 11, 1874, being chapter 430, laws of 1874, and any acts amendatory thereof or supplemental thereto. Under judgment of foreclosure against the New York West Shore and Buffalo Railway Company (incorporated by consolidation June 14, 1881), the property and franchises of said company were sold at public sale on the 24th day of November, 1885, and on the 5th day of December, 1885, were duly conveyed to the purchasers, J. Pierpont Morgan, Chauncey M. Depew and Ashbel Green, joint tenants. On the 5th day of December, 1885, said purchasers organized the West Shore Railroad Company and on the same day conveyed certain portions of the property and franchises so acquired to the West Shore Railroad Company. Under date of December 5, 1885, the railroad property of the West Shore Railroad Company was leased to The New York Central and Hudson River Railroad Company for four hundred and seventy-five years from January 1, 1886, with the privilege of a further term of five hundred years, at an annual rental of the full amount of interest at four per cent on outstanding beads secured by a first mortgage not exceeding $50,000,000 of principal. This lease was ratified by the Legislature of the State of New Jersey. From the first day of July, 1890, the Syracuse Ontario and New York Railroad was operated as the Chenango branch of the West Shore Railroad, and on the second day of April, 1891, the railroad and property of The Syracuse Ontario and New York Railway Company were formally leased, for the term of its corporate existence, to the West Shore Railroad Company. On June 30, 1891, the entire capital stock of The Syracuse Ontario and New York Railway Company was surrendered to the West Shore Railroad Company and the former company was formally absorbed by the latter under authority of law. The Syracuse Ontario and New York Railway Company was formed by articles of association filed in the office of the Secretary of State of the State of New York on the 20th day of June, 1883. This last named company subsequently acquired by agreement of purchase the railroad, which had been sold under foreclosure, formerly belonging to The Syracuse Chenango and New York Railroad Company, extending from the city of Syracuse in Onondaga county to the village of Earlville in Madison county. The Syracuse Chenango and New York Railroad Company was incorporated April 7, 1877, as successor of the Syracuse and Chenango Railroad Company, which was incorporated May 14, 1873, and sold March 17, 1877. The Syracuse and Chenango Railroad Company was the successor of The Syracuse and Chenango Valley Railroad Company, incorporated April 16, 1868, road opened February, 1873, and sold July 8, 1873. 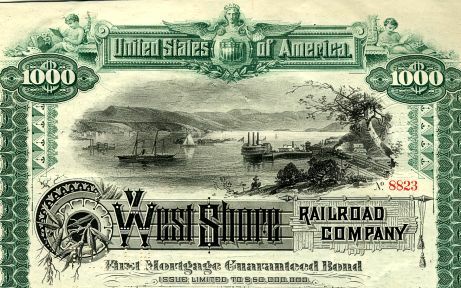 On July 9, 1901, the West Shore Railroad Company merged with itself the West Shore and Ontario Terminal Company, formed on June 20, 1883, as The Open Cut and General Storehouse Company (the name being changed on the same date) by consolidation of The National Stock Yard Company (incorporated March 16, 1869, supplemented February 23, 1870), The Midland Terminal and Ferry Company (incorporated by change of name March 7, 1873, from The Weehawken Transportation Company, incorporated March 22, 1871) and The Open Cut and General Storehouse Company (incorporated March 22, 1871, in the state of New Jersey as a reorganization after sale, on September 21, 1881, of The Weehawken Ferry Company, incorporated March 25, 1852, in the state of New Jersey). New York West Shore and Buffalo Railway Company, incorporated June 14, 1881, in the states of New York and New Jersey, by consolidation of North River Railroad Company (incorporated May 5, 1881) and New York West Shore and Buffalo Railway Company (incorporated February 18, 1880), opened January 1, 1884. North River Railroad Company was a consolidation of North River Railway Company (incorporated April 3, 1880) and The Jersey City and Albany Railway Company of the States of New York and New Jersey (incorporated by consolidation January 28, 1879, in the state of New York, and January 25, 1879, in the state of New Jersey. The Jersey City and Albany Railroad Company was incorporated June 24, 1873, in the states of New York and New Jersey by consolidation of The Ridgefield Park Railroad Company, incorporated April 4, 1867, and Rockland Central Railroad Company, incorporated July 29, 1872, by consolidation of the Rockland Central Extension Railroad Company, incorporated May 29, 1872, and The Rockland Central Railroad Company, incorporated May 23, 1870. On September 28, 1877, the New York portion of The Jersey City and Albany Railroad Company was sold and on October 12, 1878, was reorganized as The Jersey City and Albany Railway Company, New York. The New Jersey portion of The Jersey City and Albany Railroad Company was sold August 17, 1878, and reorganized as The Jersey City and Albany Railway Company, New Jersey. These two companies were organized January 28, 1879, in the state of New York and January 25, 1879, in the state of New Jersey by consolidation, under the name of The Jersey City and Albany Railway Company of the States of New York and New Jersey. New York West Shore and Buffalo Railway Company, the first corporation bearing the name, was formed February 18, 1880, as a reorganization after sale of The New York West Shore and Chicago Railroad Company (incorporated July 13, 1870), which had merged with itself on July 21, 1877, the West Shore Hudson River Railroad Company (incorporated October 28, 1867), which, on March 31, 1868, absorbed The Hudson River West Shore Railroad Company (incorporated February 16, 1867).